World clean energy capacity has increased to 648GW, in the US 49% of the electricity generation added in 2012 came from clean energy sources. In 2012 China invested 65.1 billion US Dollars in clean energy, that’s just in one year! 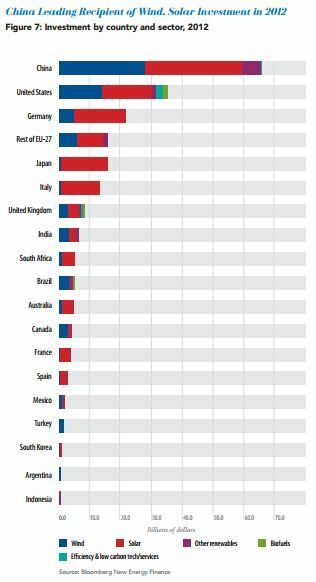 The US had the second largest investment, followed by Germany in third place. Investment in wind energy has slowed over the last few years, with solar energy taking over as the largest investment across the world. 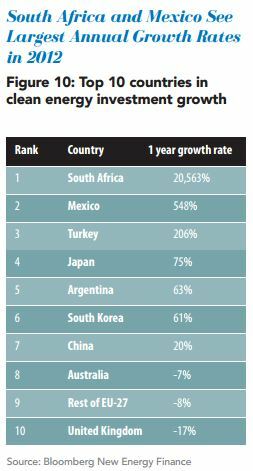 South Korea leads the 5 year growth rate in clean energy across the globe, with Australia coming in a respectable 5th. One of the favourite things Australians like to do during the Olympics is to compare the medal tally on a per person or a per GDP basis, elevating us up to at least 2nd if not 1st place. So in line with that trend I have pulled out the table from the Pew Environment report. 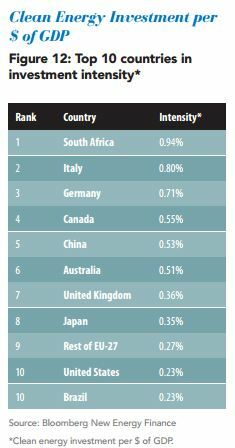 So although Australia is 11th in total investment, we come out 6th in investment per GDP. Go Aussie, Go. But one the most amazing growths came from South Africa. Yep, 20,563% growth. Followed respectably by Mexico at 548%. 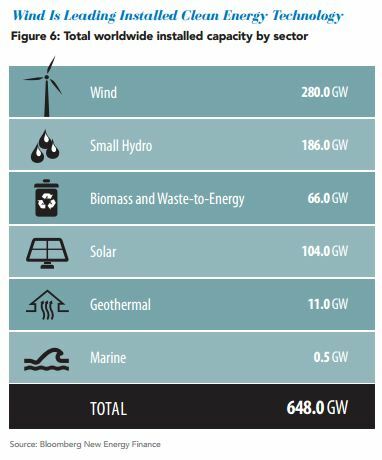 The report does highlight a future challenge for Australian clean energy investment. In China the majority of the added capacity from from ‘Asset’ financing, being large scale financed schemes. In Australia the percentage from ‘asset’ financing is quite low, with the majority of installed capacity coming from ‘ Small scale distributed capacity’ – residential scale capacity. This was driven in a large way by the increase buy back of renewables from the utility companies, this was lowered in 2010 and is reflected in the -7% growth in 2012. The future challenge is how we drive this forward is the buy back rates aren’t increased. The continued commitment to the renewable energy target for utility companies will help drive this. I just hope this stays after the election in September.